I know this is a super early time in the month to be posting about favourite products but I wanted to get this up before I go away. The main reason being I knew I'd probably end up writing about products I bought and owned for less than a week on my return-#bloggerlogic. 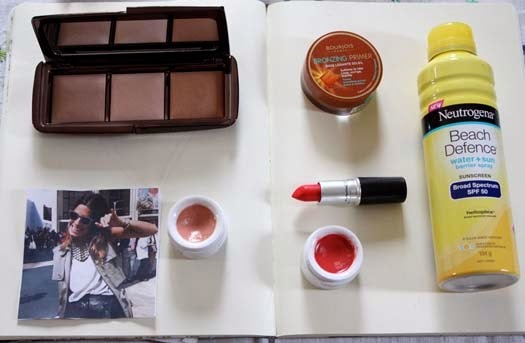 This month's favourites is a slightly unusual mixing of products but you should definitely notice a theme here..
Bourjois Bronzing Primer, available here. Dubbed the alternative to the Chanel cream bronzer and it certainly delivers. While this is a bit too dark for me to use all over my face it works well underneath bases to add a touch of warmth to your skintone. It is incredibly easy to blend so you aren't left looking noticeably orange. You can wear this alone or as a primer which makes it perfect for lazy makeup days. Hourglass Ambient Lighting Powder, limited edition. This palette has only been in my possession for a week but given it's being used daily it deserves a mention. You can read full ravings here but this palette has highlighting, setting makeup and subtly bronzing the complexion all covered. Each of the powders is designed to add a soft-focus effect to the skin and masks imperfections in the process. The palette itself is sold out now but all these powders except for the highlighting shade are available separately so you can always pick up one of those. Korres Lip Butters in Jasmine and Pomegranate, available here. These are fantastic for keeping your lips hydrated and silky smooth during the Summer months. If you're wearing matte lipstick, or any lipstick actually, these are great to apply beforehand as they make your lips that much smoother. These are also deliciously scented and subtly tinted so they're the ideal no-makeup day companion. Neutrogena Beach Defence Sunscreen* I'm one of those people who tends to burn quite easily so I always wear a powerful sunscreen, especially around this time of year. As this sunscreen is in spray form you have more control over how much you end up applying so less gets wasted. The sunscreen isn't too thick or overly greasy which I like as well. It also has a tropical scent which makes a nice change from the standard sunblock fragrance. I haven't burnt once since I've been using this so I'd say it's doing a good job. Mac Cosmetics Retro Matte Lipstick in Relentlessly Red, limited edition. This berry-red lipstick is stunning. This applies like a Cremesheen and then dries matte. It has fantastic staying power as well so you aren't left having to touch this up very often. This and Lady Danger have been my go-to lip colours this month. They're such vibrant, Summery shades. Man Repeller Given that I have been reading this blog religiously for the last month it would have been rude not to give it a mention. Leandra's writing is just fantastic and so brilliantly crafted-I love it. She has this ability to make what may seem like banal garments enchanting. Her photos always complement her posts well. When her personal outfit snaps aren't utilised you can always bet there'll be a gallery of stunning editorial and runway shots to take your fancy instead. Get on the bandwagon if like me you'd been under a fashion-deprived rock. Ooo that Mac red lippie looks and sounds amazing. Might have to check it out!